Wet room to master suite. Completely remodelled and designed in a contemporary style. 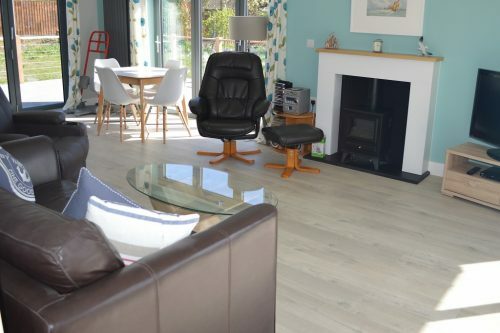 The Anchorage is a fabulous and funky fully refurbished accessible holiday cottage in Cromer. Situated in a peaceful position just a few minutes from the town centre and famous pier. The property is bright and light with large windows. There is contemporary hard flooring throughout. There are two bedrooms, both with en – suite shower rooms. The master suite having the advantage of a large contemporary wet room. The house is designed to be of ease for anyone using a wheelchair, but without compromise on style and luxury. The wrap around deck really does bring the outside in and is perfect for al fresco dining or a gin and tonic in the evenings. There is parking outside with a sloped driveway for accessibility. Ramp with handrail to front door and wrap around decking to rear of property which is wheelchair friendly with ramp down to back garden. Open plan sitting room: with feature fireplace housing a contemporary woodburning stove effect electric fire, perfect for cosy evenings. Leather sofa, dual motor riser/recliner chair, side tables, coffee table and lamps. TV with Freeview, DVD player, WIFi. Music system. The room is sunny and light and you can really bring the outside in with the two sets of bi fold doors. The wrap around deck is a wonderful feature. Accessible from the sitting room leading to the pretty gardens. A wonderful place to sit for a sundowner! Kitchen/Diner: All newly fitted. Accessible hob, remote control electric cooker hood, side opening oven with pull out worktop for. Lowered sink, microwave, toaster, dishwasher, fridge freezer and washing machine. Dining table and chairs for 4 guests. Hall Cupboard: with iron and ironing board. Bedroom generous bedroom with built in cupboards and full sized twin beds with orthopaedic memory foam mattresses. Non allergenic pillows and duvets. Side tables and reading lamps. Sockets with USB outlet for charging phones cameras etc. Ensuite shower room: with low level entry shower tray and large chrome ‘Rainforest’ style shower head and hand held shower. WC and basin, Shaving point. Bedroom 2 Accessible Bedroom: with electric head and foot adjustable beds (NOT PROFILING BEDS) which can be linked together or made up as singles. Memory foam mattresses, non allergenic pillows and duvets. Bedside tables with touch sensor reading lamps. Wardrobe and chest of drawers with TV, sockets with USB outlet for charging phones etc. Accessible en suite Wet Room: Beautifully designed and contemporary. This wet room is fully tiled with non slip tiles and a has a fabulous Roll in “Rainforest’ style shower, with hand held shower. Wall hung basin to allow for wheelchair users to get close to the basin. Worktop next to basin for toiletries. WC with wheelchair access from both sides and aluminium pull down grab bars on both sides. Mirror and shaver points. Hairdryer. A Chiltern Invadex Shower chair is available for use in the wet room and will fit over WC, or alternatively a stand alone shower seat is also available. Also available in the bungalow for use to transfer from wheelchair to bed or riser recliner chair is a Return 7500 stand. If you do have specific needs please do check with us before booking. The Anchorage is situated in a quiet cul de sac on the edge of the town. There is no passing traffic. The property sits in a very pretty garden with lawned areas and open views. The joy of the outside space is the wonderful wrap around deck giving access to two sides of the garden and is a great place to sit for a sundowner. The driveway is fully accessible with ramps and close parking for two cars. The garden is fenced. Cromer town centre is just a short drive, as is the famous pier and beach. The pier and promenade are accessible to wheelchair users.